ALMOST every Mitsubishi model sold in Australia over the past 10 years — close to 500,000 cars — and 324,000 of Toyota’s most popular cars are being recalled for safety reasons. Although the faults are different, the recalls for 800,000 cars amount to the highest number ever issued in a two-day period in Australia. 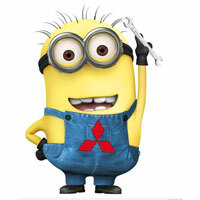 Mitsubishi is recalling a range of models made over the past 10 years including Lancer sedan, Triton ute, Pajero 4WD, Outlander SUV, Challenger SUV, Colt hatchback and the iMiev electric car. Faults include electrical problems which can affect turn signals, wipers and lights. On the Mitsubishi Evo performance car the handbrake cable can rub on the fuel tank, causing it to rust and leaving it exposed to a possible fuel leak. I know what I'm doing first thing tomorrow! Last edited by Lancer1993 on Thu Jun 30, 2016 8:04 pm, edited 1 time in total. An inappropriate manufacturing process of an electrical part on a manufacturing line may cause the voltage inside the ETACS ECU to be unstable. The head lights may turn off and/or the window wipers may become inoperable. Under certain driving conditions, this could potentially cause an accident. The turn signal and lighting switch connector terminals may become worn during switch operation due to insufficient rigidity. This may result in an accumulation of oxidised dust on the connector terminals. Excessive dust accumulation can act as an insulator, affecting proper terminal conductivity. Continued usage under this condition could cause conduction failure resulting in head lamp, turn signal lamps, parking lamp, front/rear fog lamp, tail lamp, number plate lamp and cabin lamp failing to operate or to operate intermittently. Last edited by Skrallex on Thu Jun 30, 2016 7:50 pm, edited 1 time in total. Either wait for the call/email or just call and give them your rego and they can look it up to see if your CJ is part of the recall. Amazing I don't remember seeing anything about this on the TV news tonight. I doubt they would have my email as I bought it second hand and never re-registered it with mitsubishi or anything. The recalls.gov.au site lists the VIN # ranges affected, can confirm mine may be affected by the second one, the signal and lighting switch oxidation issue. Wasn't there someone new to the forum with fog light and cluster issues, could be the oxidation issue? FYI mines in the " An inappropriate manufacturing process of an electrical part on a manufacturing line may cause the voltage inside the ETACS ECU to be unstable." what ever that means? What gives with the VIN ranges provided on the recall? Observe that the characters wrap around? So is it read that all vehicles from JMFSNCZ4A9U000201 to JMFSNCZ4A9U999999 and then JMFSNCZ4AAU000001 and so on? Or is that trying to say only 14 vehicles made are affected - 201 to 214 (inclusive)? Lancer1993 wrote: Wasn't there someone new to the forum with fog light and cluster issues, could be the oxidation issue? Voltage Regulator soldered on the board has poor manufacturer quality perhaps? A few reasons, but I bet it's close to one of those, so the answer is to replace the ETACS ecu. Please note there are THREE separate recalls for the Lancer. The first applies to 09-10MY Lancer sedans and sportbacks. Last edited by burfadel on Thu Jun 30, 2016 9:53 pm, edited 1 time in total. The second appears to apply to all CJ Lancers, around 121,000 in total. New ETACS ECU maybe I can get them to activate a few things like having the doors lock when you go over 30kph. Wonder how this might effect my Instrument Cluster upgrade I have now planned for next week? I'll get on to them in the morning but if the last recall for the drive belts is any guide odds are the dealer probably doesn't even know about it yet. Edited - just looking at the other thing and mine might be on that list too... could be a long day to get it checked when booked in. Wonder how long parts will take to come in and if they become short of supplies like the drive belt issue? Last edited by Lancer1993 on Thu Jun 30, 2016 10:02 pm, edited 1 time in total. The rear right hand side parking brake cable may interfere with fuel tank and may result in damage to the protective coating of the fuel tank. The fuel tank might rust through, allowing fuel to leak. Lancer1993 wrote: New ETACS ECU maybe I can get them to activate a few things like having the doors lock when you go over 30kph. Wonder how this might effect my Instrument Cluster upgrade I have now planned for next week? It is a safety recall and not a warranty issue, however better be on the safe side as it's a matter of argument. Yeah I was wondering about the CJs Merlin have tuned, guess he might be getting some more business to retune those who might get a new ECU. I'm gonna get in early and beat the rush, can't hurt to ask about changing or activation some of the setting, if they know how to do that. My bet is my car might be with them for a whole day if they have to change the ECU and check for corrosion on connections. As I said I'll need to ask if any of this affect the instrument cluster, don't think it does but I'd hate to change it only to have them mess with it. Lancer1993 - ETACS ECU does not equal Engine Control ECU.. Merlin's tuning will live in the engine control ECU (and probably Merlin's laptop too). DONE - booked in for Monday, they will check it first and if parts are required they will replace them which might mean a 2nd visit if none are in stock. I suggest others do likewise as they could get very busy very quickly with half a million cars to check.